I’ve always loved music, and being a creator I’ve always tried to create music. While I tend to be good at art and engineering, I’ve never felt confident in my ability to make music. A few years back I decided to study music theory, to take an academic approach towards music. I realized that there was a lot of memorization so I thought about building a software program that would incorporate music theory. The result was a program I called Mozart – you can check out it’s official site here: www.mozartprogram.com. Recently I’ve been working with electronics a lot and I finally realized something: I now have the knowledge to build a hardware version of Mozart! Something I could have only dreamed of up to this point. My mind started racing and soon enough I found my self spending wads of money on electronics components so I could make my dream a reality – a colorized musical instrument that has music theory built in. This project was very challenging, but my most fun electronics project so far. I am glad to have made something that’s actually useful – not just a blinking led. For this project I used an Arduino microcontroller, a serial enabled LCD display and a few MIDI ports. The exciting thing about making this project MIDI compatible is that it now can hook up to all kinds of synthesizers including all the classics. MIDI has been around for awhile, so I was proud to be able to support that standard instead of simply using USB. 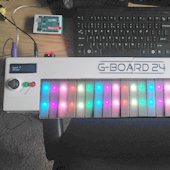 Oh, and it’s called the G-Board 24 because G stands for Cool (also my name Greg), and it has 24 keys. This means it can span 2 octaves in Chromatic mode, or 3 octaves in any key+scale. Check out a video below for a tour of the instrument!